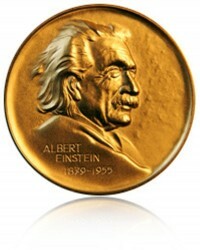 The members of the Interdisciplinary Committee have chosen Professor Ozin as the winner of the 2011 “ALBERT EINSTEIN” World Award of Science for his pioneering accomplishments in the field of nanochemistry that have helped to define and establish the rapidly expanding discipline, which has now become the cornerstone of modern chemistry. The “ALBE RT EINSTEIN” World Award of Science was created as a means of recognition to those men and women who have accomplished scientific and technological achievements which have brought progress to science and ensuing benefit to mankind. More information on the award can be on the World Cultural Council’s website.